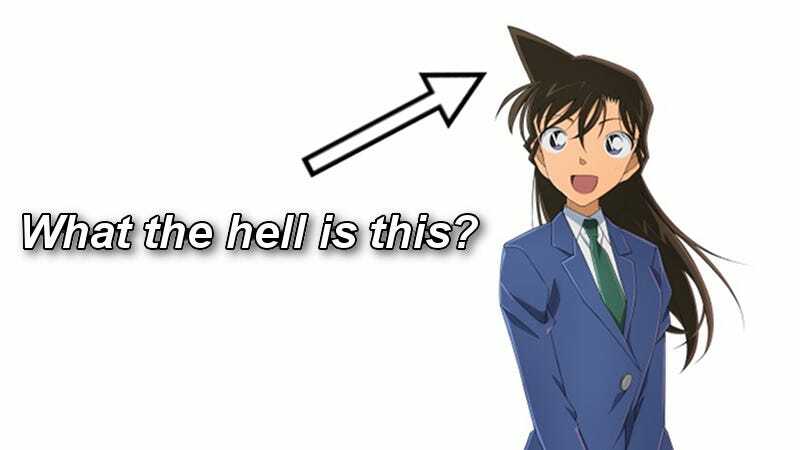 Rachel Moore (aka Ran Mouri) is one of the main characters in the hugely popular Case Closed (aka Detective Conan). Her hair is bizarre. This is why the character can be tricky for cosplayers. Oh. Hrm. It’s like a hair cone. Even official cosplay looks off. Here, we have model Rui Kumae dressed as the character at a press event for a Detective Conan app. See how Kumae’s cosplay stacks up against the character? This official outfit is literally a cone stuck on the character’s head. No wonder people often make fun of Mouri’s hair. But the character’s hair wasn’t always like this. When the Detective Conan manga debuted in 1994, the character had a fairly normal ‘do. But then it evolved, as you can see in these image via Twitter user Takumi. What caused the change? Maybe her hair became patterned after pop star Shizuka Kudo’s style? In Japan, Kudo was incredibly popular in the 1980s and the 1990s. So, that isn’t a hair cone on the character’s head, but a popular hairstyle of the time. Takumi redrew the character in a more realistic fashion, showing how the ‘do actually works and that Ran Mouri isn’t a conehead. Phew. Good to know! But wait. In the anime, her hair has a highlight, which confuses things, indeed making it look like there is a hair cone on her head. You know what could be the answer to this puzzling hair?